The most popular trailer on the market today! The 2019 Nitro Hybrid is the most versatile design and easy towing trailer, giving you the most bang for your buck. Why do we call this model of trailer a "HYBRID"? A lot of customers still refer to these as "Snowmobile Trailers" as that is what they are primarily used for, but in reality they can be so much more. With many features adopted from our popular line of trailers making them just as versatile as any other. ​Our Hybrids are still based on the old school "Clamshell" shape, making it aerodynamic with optimum fuel savings, but we've redesigned the front slope allowing better fitment for 2 ATV's. Updated this year is a 2.5" lower ride height and 9" wider wheel stance, making it the lowest and most stable deckover design on the market. Fully equipped with a rear ramp instead of a tilt deck, allowing you to drive, or even walk, anything inside that you need to transport. With an interior roof height of 64.5 inches not at the studs, the average adult can just about stand up inside. 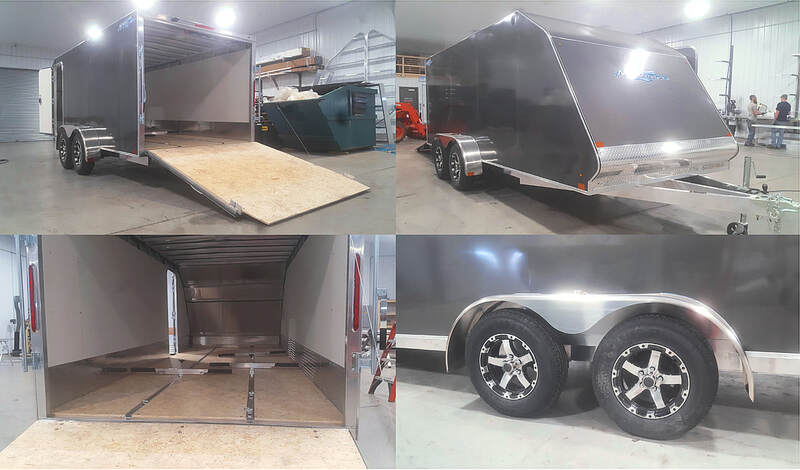 Other convenient features include - RV style radius side door with heavy duty step - Large locking front hatch door for quick access - High grade engineered wood flooring designed specifically for trailers. 66" Wide model also available for just 1 snowmobile.